Consider the timespan of discretion within which a person takes up a role. The discretion can be expressed in terms of a span of complexity – the complexity being the scope of the circular linkages that have to be considered systemically in the execution of the role. So a care worker, Bert, who is responsible for the way on which Great Aunt Agatha has a day out, will have some measure of discretion within which to fashion the number of activities that need to be synchronised with each other. A narrative of the day out will be formed within the context of the actors involved, but the actors (amongst whom will be Bert and Agatha) will themselves be subjected to the structures within which they exercised discretion in how the day is put together: To be subjected to structure is thus to be constrained to exercising choices within the context of these structures. [2,3] Working psychoanalytically involves understanding that these structures are both physical and social in nature (for example the physical size of the van to get there but also when social processes make the van available for use), but that alongside these structures there are also unconscious structures, leading to a double subjection. He is not asking “what would you like to do today?”, since this would really be asking at the level of what narrative would Agatha like to be able to tell about the day. Neither is he asking “tell me the criteria by which you would like me to organise today”, since anything that Agatha was able to say as an actor would be her espoused theory about what she likes to do – not necessarily wrong, but vulnerable to being mistaken nevertheless. Neither is he asking “tell me the resource and social structures that I should assume as constraints in designing your day out”, since Bert’s job is not to assume such constraints in creating Agatha’s day out, but rather to find ways of working around such constraints as do exist in arriving at something appropriate. What Agatha really really wants is a day out that takes her to the edges of what she knows and understands… something a little different and a little challenging but nevertheless satisfying. Not so easy to do in practice. This situation facing Bert in taking care of Great-Aunt Agatha is developed further in papers on THE environment does not exist, and organisations without boundaries. Some of the ways in which this structuring produces its effects are in architectures that integrate differentiated behaviours. 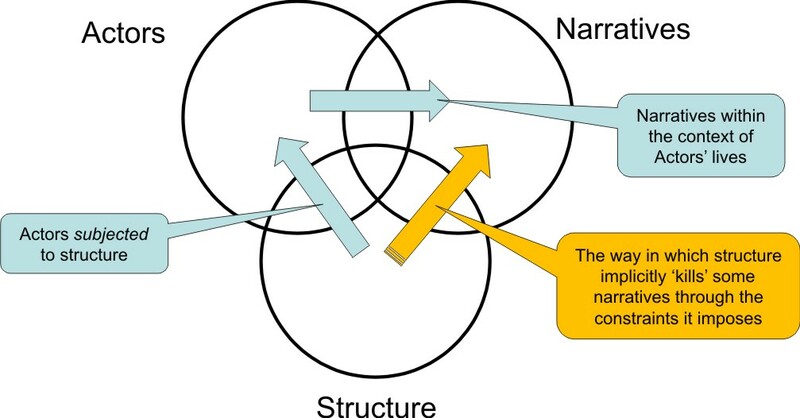 These structuring effects do not fall equally on different actors, the point about strategy ceilings being that some structuring assumptions are put in place to serve the interests of certain actors over those of others… thus senior management and investors may may benefit very differently to customers. In effect, therefore, there are two ‘kinds’ of structure to which we are subjected, one ‘exo-structure’ familiar to the social scientists, the other an unconscious ‘endo-structure’. With double subjection comes, therefore, a question of the way we – as subjects – embody particular forms of relation between these structures – particular forms described by Lacan in terms of the four discourses. The challenge is to approach this in terms of a search for innovation rather than in terms of defences against anxiety – a difference explored more deeply in anxiety and innovation. Previous article What is happening to ‘Boundaries’, ‘Authority’ and ‘Containment’?